I Got Somethin’ to Tell You: Moms Mabley movie by Whoopi Goldberg revives a comic legend. When people are asked to list the legends of comedy, the same names tend to come up: Bob Hope, Richard Pryor, George Carlin, Redd Foxx, Bill Cosby, and so on. Every so often a female comic gets mentioned—Lucille Ball, Joan Rivers, Phyllis Diller. 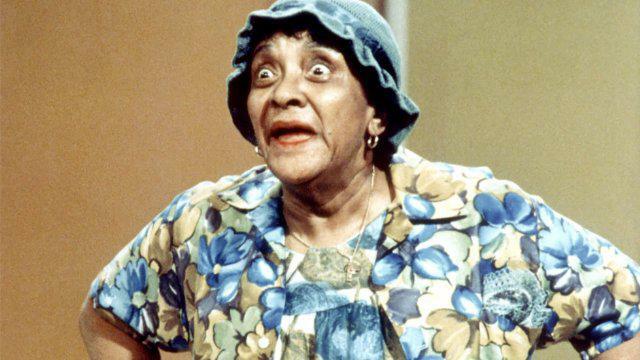 One person who doesn’t get talked about nearly enough by comedy lovers and contemporary comedians alike is Moms Mabley. In her directorial debut, I Got Somethin’ to Tell You, part of this year’s Tribeca Film Festival, Whoopi Goldberg tries to correct this, profiling the beloved comedienne who made a name for herself in an old house dress, floppy hat, and no teeth. First, a short primer on Moms. Born Loretta Mary Aiken, she was a pioneer in her field—a black woman who pushed the boundaries of taste, politics, and race as far back as the 1920s, while performing on the Chitlin’ Circuit. Very little is known about Moms Mabley’s life off the stage—even her birth year is disputed—but it’s widely known that she was a lesbian who also went by the name “Mister Moms.” (In the film, a holiday card is shown with an image of Moms dressed in men’s attire.) She earned respect from her (mostly male) peers and from audiences with her ribald humor about her (apparently fictional) love for younger men, her admittedly frumpy appearance, and smart—but somehow never bitter—takes on racism. Her career extended well into the ’70s, leaving behind a legacy of over 20 albums, and memorable appearances on many of the popular variety and talk shows of the day, including Ed Sullivan and The Smothers Brothers. It’s a good question, especially considering all of the comedians, male and female, Moms influenced. (The likely and perhaps unsurprising answer is that comedy is still largely dominated and curated by men and by a very small group of women, most of whom are white.) Kathy Griffin, whom Goldberg interviewed, talks about watching Moms perform on The Ed Sullivan Show when she was a kid, and how her costume reminded her of her own mother. Eddie Murphy notes that the Grandma character in The Nutty Professor (played by Murphy himself) is a direct tribute to Moms. Arsenio Hall recalls sneaking a listen to the comedienne’s risqué albums during his childhood when his parents weren’t home. Before seeing this film, I had heard of Moms, but had never actually heard Moms—and there is plenty to be heard in I Got Somethin’ to Tell You. Because there isn’t much to say about her personal life, the film focuses on her material, showcasing footage and fun cartoons for routines that Goldberg could only find the audio of. The material speaks for itself: Moms’ sense of humor and perspective feels as fresh and funny as it must have then. (The audience I saw the film with laughed heartily throughout.) HBO has acquired the documentary, and it will air on the network later this year. Towards the end of the discussion, Goldberg said she hopes her next project will be a 10-part documentary chronicling black entertainment from the mid-1800s to the present. I Got Somethin’ to Tell You is just the “tip of the iceberg,” she said. It’s an ambitious project, to be sure, but if she’s able to pull it off, she’ll be doing a great service for the history and memory of black contributions to American culture, so many of which have been lost or forgotten.